Looking for a middle ground between tent camping and a cabin? Try a yurt. These funky, circular dwellings have been used by Central Asian nomadic cultures, particularly in Mongolia, for thousands of years. In fact, some Mongolian towns still have yurt quarters, and the trend has caught on here in the States. Yurts are great intermediary dwellings for those looking for a sampling of rugged living with a touch of glamping (glamour camping). 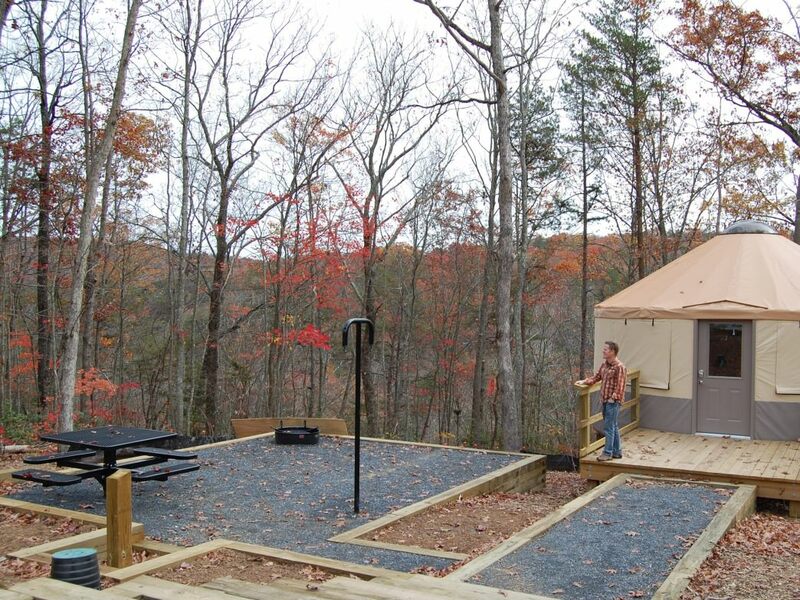 Five Georgia State Parks now have yurts, with a sixth park adding them later this year. These welcoming structures are built out of flexible wood lattice and wrapped in canvas, and each includes a skylight built into the domed roof. 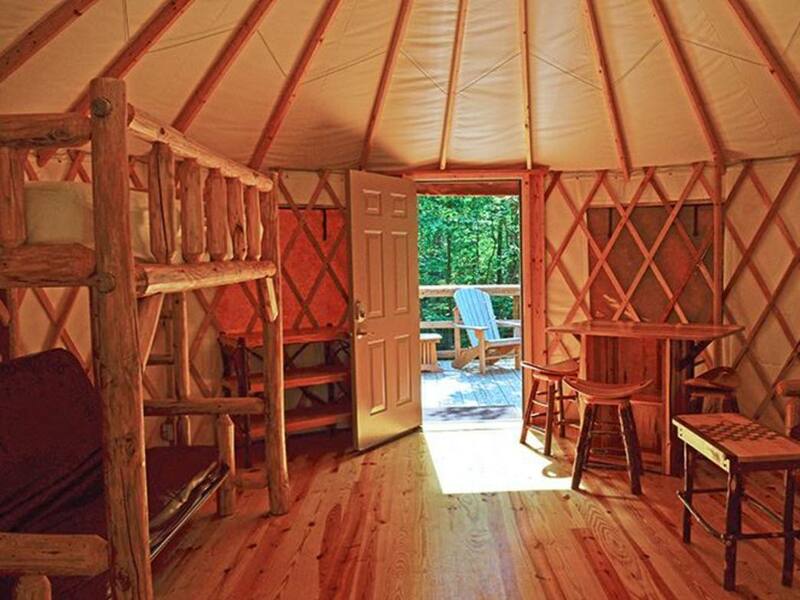 The yurts in Georgia State Parks have many of the same features that a cabin has: a back deck, a ceiling fan, a space heater, furniture, and an outdoor picnic area with a fire ring, grill, and water spigot. There’s no air conditioning, but you’ll find electrical outlets. While you aren’t exactly roughing it, you still have to walk to the community bathroom. And there’s no refrigerator, so bring a cooler. Yurts are somewhat reminiscent of an outdoor dorm room, where groups of six friends or family (five at High Falls State Park) can bunk up for a rustic night's sleep away from home. 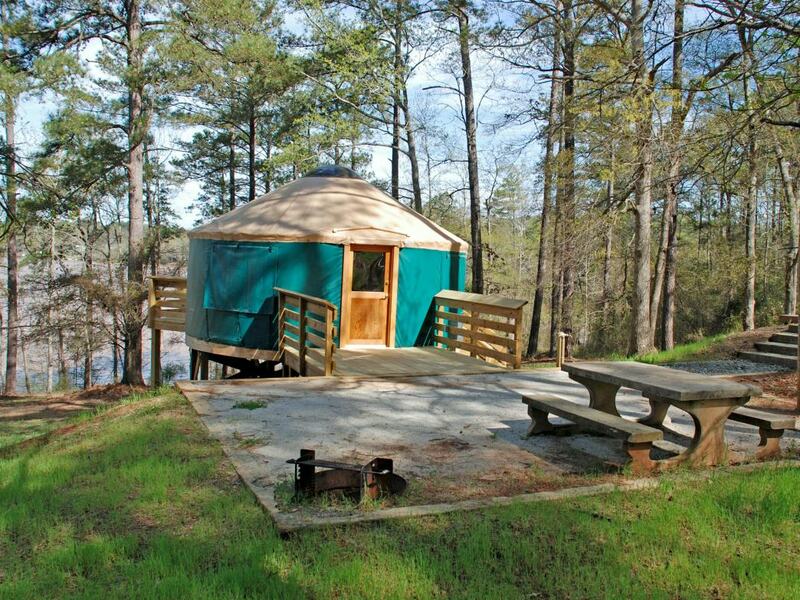 Here’s where you can find yurts in the Georgia State Park system, and what to do during your stay in the yurt village. High Falls State Park is best known for High Falls, the largest waterfall in middle Georgia. Whitewater rushes over the sloping rocks, tumbling 135 feet into the Towaliga River. High Falls’ six yurts line the eastern edge of the lake under a sunlight-filtered canopy of pine and deciduous trees. 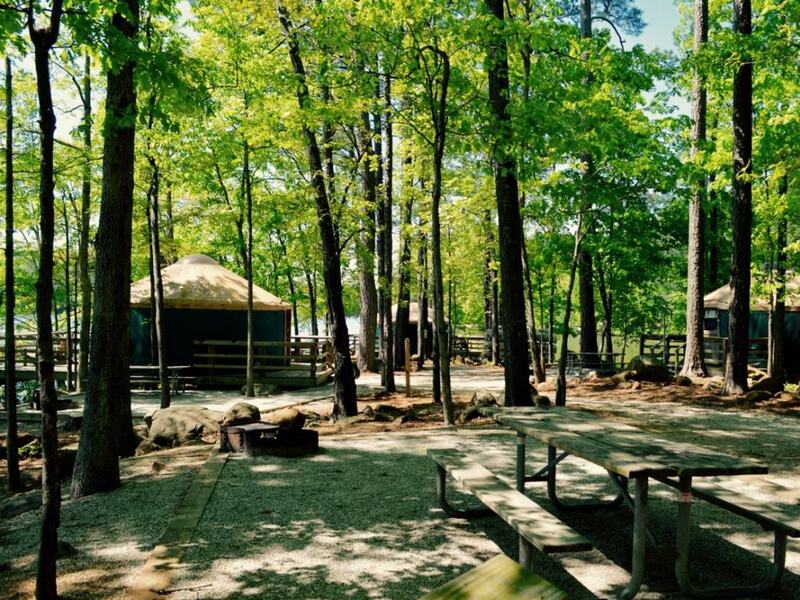 Yurts 1 and 2 are right next to each other, so book as a pair for a large group of friends. High Falls Lake teems with white bass, so rent a jon boat and launch from the boat dock, just beyond the yurt village. Also close to the campgrounds is the swimming pool (lake swimming is prohibited), and the High Falls Trail is just across the main road. Red Top Mountain State Park’s peninsula sits like a leaf on Lake Allatoona, and its jagged edges breach the shores of the 12,000-acre lake. Book in advance, because there is only one yurt at the park. The yurt is hidden, and accessing it evokes the feeling of a top-secret hideaway; a code is even required to enter the campgrounds. Red Top Mountain’s red-soiled trails weave through 15 miles of rolling hills—perfect for a long distance trail run or hike. Your shoes are bound to tint slightly red from the soil’s high iron-ore content. Every Saturday evening in summer , pack a picnic and meander to the Old Vaughn Cabin to listen to a live bluegrass concert. Just south of Athens, Fort Yargo State Park is a true retreat, where you’ll find a sense of solitude and pristine beauty. Marbury Creek Watershed is a mere 260-acres and cuts through the center of the park. The yurt village clusters a group of five yurts on their own peninsula of the lake. 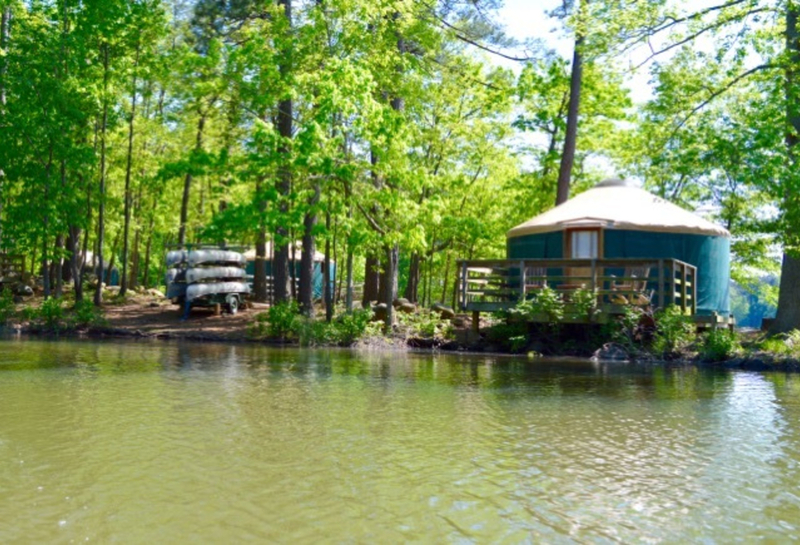 Yurt 3 has the best views, as it sits on the elbow of the lake’s biggest bend. You’re surrounded by water on all three sides, giving views of the lake’s west and northern banks. Sitting on the back deck mimics the feeling of being on the water. The yurts are located a few hundred yards from the boat ramp, and a canoe rack is in the village, where $15 will rent one for your stay. Fort Yargo State Park is a good training ground for mountain bikers looking to hone their skills on an intermediate track. The 12.5-mile trail circles the perimeter of the park in a series of twists and turns on predominantly singletrack dirt trails. A fine example of Georgia’s natural beauty can be found at Cloudland Canyon . Sitton Gulch Creek carves out the park’s deep gorge, and a hike down the West Rim Trail takes you down 600 steps to the belly of the gorge’s floor. The trail leads right by the yurt village, and 10 yurts are nestled in the thick brush of towering pines and hardwoods. This village is more secluded than any of the other campgrounds in the park, but it's still only a few hundred paces to your car. With the yurt’s convenient access to the West Rim Trail, rise early and hike east across the bridge to link up with the Overlook Trail. If you’re lucky, you’ll get a chance to see the fog clinging to the lip of the gorge. Since there’s a minimum two-night stay in these yurts, spend the second day doing a caving tour with Georgia Girl Guides. Tugaloo State Park’s claim to fame is its stretch of real estate on Lake Hartwell, one of the Southeast’s largest lakes. Many flock to the 55,590-acre lake for boating, where you can fish for largemouth bass, waterski, or canoe around the border of the park. 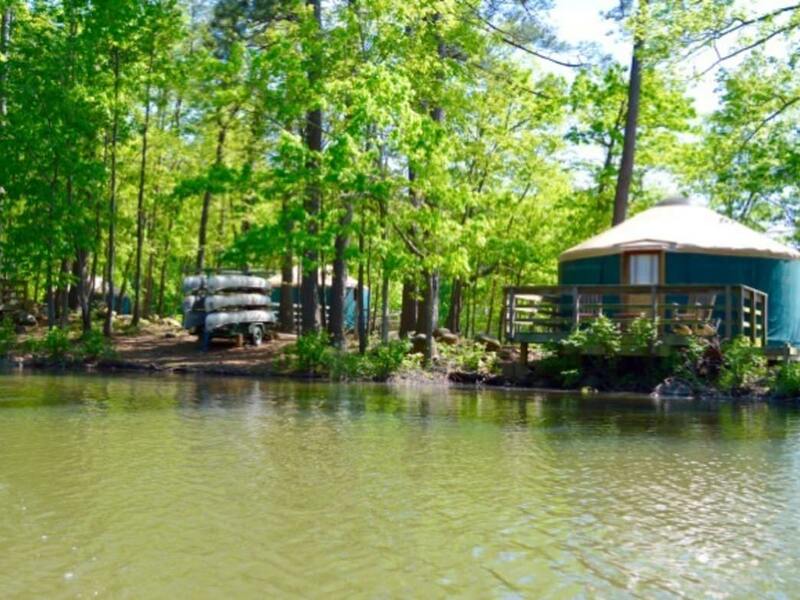 While you’re spending the day on the crowded waters, the yurt village offers an escape from the populated campgrounds of the park. 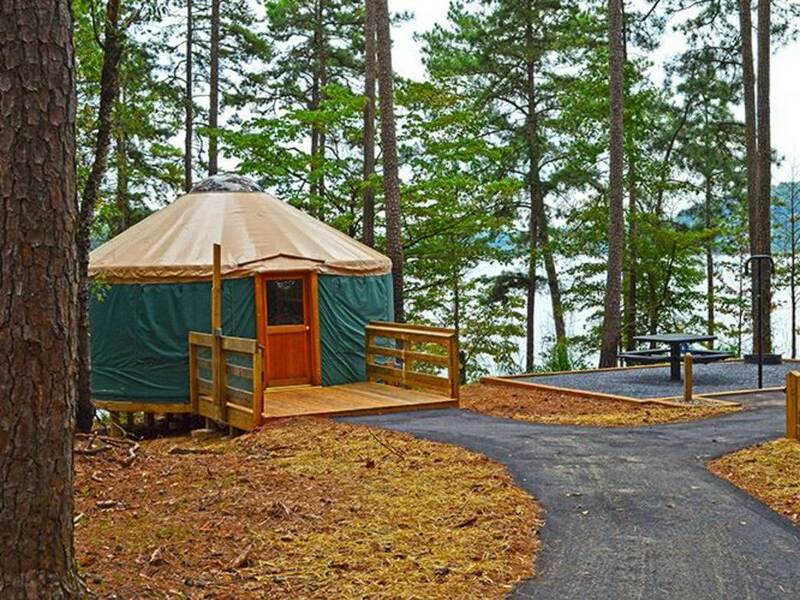 Each of the six yurts branch out from the main yurt village path to provide a personal waterfront view of Lake Hartwell. If you can snag yurt 4, it’s the closest to the knob of the peninsula, and the back porch offers a stunning view of the lake. The yurt village takes a step up in luxury with an additional group pavilion. With Tugaloo State Park so close to the South Carolina border, it’s an hour drive north to Greenville. Finally, keep one more location on your radar: Yurts soon will be just beyond the perimeter, south of Atlanta at Sweetwater Creek State Park. The yurts are expected to be available by the end of summer 2015.